Dawn Aldrich ~ Author & Blogger: A Double Portion, Please. Food is probably on my mind way too much, especially in the fall. When the thermometer registers a decline in temps my kitchen stove gets fired up. Although I'm not a great fan of cooking a gourmet meal, I do enjoy whipping up a delicious dessert, especially a home-baked pie! Pies are easy to make with very little fuss or mess and their aroma is a welcomed delight on a nippy day. It's one of those scents that wakes me from a sound sleep or reminds me of happy family gatherings. In fact, I'm always the one who volunteers to make the pies for Thanksgiving. 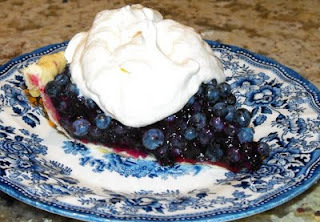 More so than baking pies, I love to eat them! My family has heard me say on many occasions, "I'd rather you bake me a birthday pie (especially blueberry) any day than a birthday cake!" To me, pies are perfect. They're not too sweet. They're never dry. They come in lots of flavors and beautiful colors inside. They can be served hot or cold and a la mode! So Saturday, when my mother served dessert at her table, guess what we had? Pies! Not just one...but two! What's better than a pie for dessert? Two pies! What's better than two pies? Two different choices of pies! Now what's a woman to do when she's watching her waistline and she's faced with such a dilemma? The answer is simple! She asks for a double portion! As three generations of our family sat around the table enjoying my mother's dessert we all had stories to share. Some were stories of what's happening now. Some were memories of by gone days when my parents were children while others were reminders of times us grown up kids had just forgotten. I love listening to all the stories, especially of times before I was born or before my memories began. It ties my family history together and fills in the blanks of how things once were or why things turned out the way they did. Most of all, it makes me wonder what stories or memories my children and grandchildren will share about their childhood or family times. Elijah was like a father to Elisha in the Old Testament. Elijah spiritually raised up Elisha as his successor as prophet to Israel. I'm sure Elisha spent many days at the side of Elijah learning all he could, like a son would with his father. When Elijah knew his time on earth was coming to an end, he asked Elisha "What can I do for you before I am taken from you?" (2 Kings 2:9). Think about it. That was an open ended question. Elisha could have asked for wealth, possessions, rank, position, honor...anything. But, he replies, "Let me inherit a double portion of your spirit." (2 Kings 2:9b). When I think of some of my relatives, I certainly would not ask to inherit their spirit, their personality or their habits! Elijah, however, was someone whom God's Spirit rested. He honored God in everything he did, how he carried himself, how he served people, how he spoke. God oozed out of every pore so much so that Elisha desired a double portion of his spirit for himself. My heart is brought into check this morning, as I reflect on my spirit. May God fill me with His Spirit to overflowing that the aroma of my life will be more delicious than a fresh baked pie. And in the end, may my children and grandchildren ask for a double portion for themselves.